Dancers and musicians from Azure Entertainment and The WA Performance School were privileged to help kick off celebrations at the Movida Estate Swan Valley Secret Supper over the weekend. This unique annual event has guests ‘foraging’ for their food throughout the day, filling their picnic baskets before receiving the address of the top secret location for the evening’s festivities. 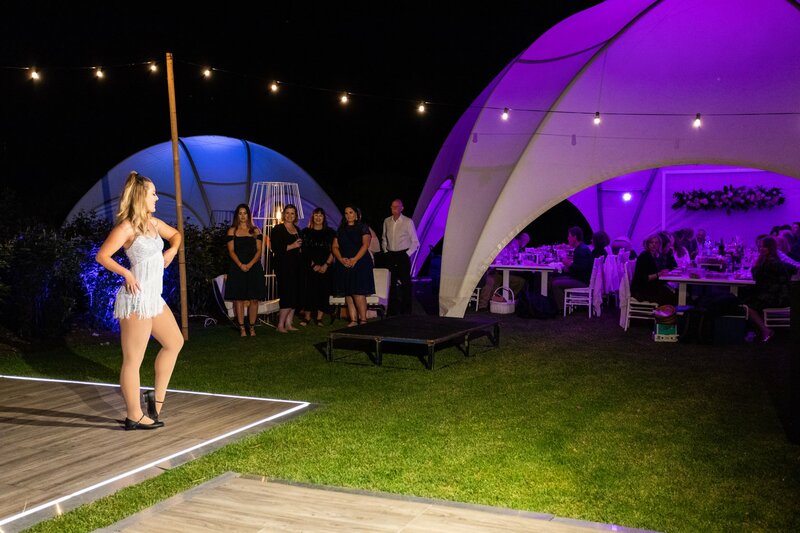 Set on the sprawling lawns of a beautiful heritage property in the Swan Valley, guests dined and danced before our top secret flashmob performance. Our specially choreographed Tap Dance flashmob started with just one performer and grew to include our professional entertainers as well as some of our advanced level tap students plus stomp-style trash can percussionists! The performance culminated in a huge fireworks display, delighting guests of all ages and giving the night a truly magical touch. We’d like to thank the City of Swan and their events management team for such an exciting performance opportunity, and congratulate them on an incredible evening that managed to remain top secret, to really give guests a great surprise! Our team of teachers at WAPS are all professional performers currently working within the industry, and combining our love of arts education with our passion for live performance is an important part of our studio philosophy. Congratulations to all our performers, particularly those students who rose to the challenge of performing in such a unique event!